In Margarita Tartakovsky's article on "10 Tips for Raising Resilient Kids," in the summer issue of Connections,(also found online at psychcentral.com), she notes that common childhood challenges of sickness, competition, bullying, loneliness, and social hurts are not easily handled. But resilient kids face tough situations and problem solve. Anxious parents need to gradually pull back from making things too easy and comfortable, thereby creating dependent, unimaginative children. To help young people, ask them to consider possibilities and choose which seems wisest. Ask how and minimize why questions. Don't create fear by visualizing catastrophe but explore the different possible outcomes and how to handle each. As psychotherapist Lynn Lyons advises, "Teach your kids all emotions are okay." Failure is temporary and valuable if we learn the right lessons from our mistakes. Modeling resiliency includes admitting our mistakes and controlling our emotions. When the young take positive action, an appreciative compliment can add their resolve to be resilient in the future. Dr. Glen Fahs is a trainer and consultant in adult education and organization development. He is the primary facilitator for the international Al Siebert Resiliency Center. He has taught at 12 colleges and universities in the fields of management, speech communication, human resources, and education. What we make matters enormously, and it doesn't matter at all. Art is crushing chore and a wonderful privilege. Make space for all these paradoxes to be equally true inside your soul, and I promise — you can make anything. The word "paradoxes" triggered my sense of connection. Those who knew Al and his work will know his delight at the discovery that very mentally and physically healthy people have paradoxical attributes and feelings and these contradictions are very healthy indeed. In fact, he claimed these attributes demonstrated flexibility. Many, many people came up to him after reading the book or after his workshops to thank him in establishing through his research and writings an environment or space where they could acknowledge and embrace paradoxes within themselves without fear — the fear of being mentally awry or not sane. In fact, to be proud of their paradoxical life knowing that a healthy dose of counter-balanced traits was a step toward resiliency. Positive self-concept open to accept the existence of flaws and weaknesses." (TSP, p 147). I admire and take extreme delight in watching creative and artistic people at work or even at thought. Their sheer joy during their creative process is very beautiful and shines outward from their very souls for all to see. This connection from the creative, artistic soul to the world is a very special gift to behold in all its glory — along with its vulnerability. Have you ever felt dread or fear in embarking on new and unfamiliar endeavor or creation especially when it is all or nothing? I am sure we all have experience such. At one time in my life, I remember voicing my thought aloud to anything in the universe that would listen stating my life was in their hands and I was just going to put one foot in front of other. I had the sense of walking along side my fear and knowing whatever the outcome, I could prevail. For me, it was moment of "I will overcome.... I can handle whatever comes my way" — a source of inner strength and knowing I could work on the situation. Strangely, there was a sense of release at that very moment and shortly thereafter, my life became better than ever before. I shared this experience because Gilbert's book intrigued me where she states a belief that "my creativity cannot take a single step forward without fear marching right alongside it.... Fear and creativity ... were born at the same time and they still share some vital organs" within her. She is of the belief that "when people try to kill off their fear, they often end up inadvertently murdering their creativity in the process." Therefore, she will make space for it. "Heaps of space.... I allow my fear to live and breathe and stretch out its legs comfortably." She seems to think that the less she fights her fear, the less it fights back. "If I can relax, fear relaxes, too.... In fact, I cordially invite fear to come along with me everywhere I go" (p 24-25). To me, this is the very concept of paradoxical living embracing fear while yearning for success. After all Gilbert and I both agree that fear can spark creativity with immense intensity. In her book, Gilbert's concepts include treating life as a 'devotional practice, act of love, lifelong commitment to the search for grace and transcendence...' to anything that 'calls to your heart and brings you to life' (www.branpickings.org/2015/09/23), and "The pursuit for something richer, more textured and more varied" (p4). She acknowledges Poet Jack Gilbert has been influential in her work as a writer, teacher and person. They are not related. However, they both taught at the University of Tennessee. In fact, she took over his teaching position at the university. Hence a sense of deeper connection to his work by Elizabeth Gilbert. be brave. Without bravery... you will never know the world as richly as it longs to be known (p 6). Gilbert believes "we are all walking repositories of buried treasures." She believes "one of the oldest and most generous tricks the universe plays on us human beings is to bury 'strange jewels' deep within us all, and then stands back to see if we can find them" (p 8). She says, "The hunt for the buried treasure is creative living.... It is the courage to go on the hunt to find our creative jewels is what separates a mundane existence from a more enchanted one.... Living a life that is driven more strongly by curiosity than by fear" (p 9), and "where success and failure become irrelevant" (p 259). She asks, "Do you have the perspective to appreciate the value of your own joy? ... Take ownership of whatever makes you shine." Live "life as a devotional practice, as an act of love and as a lifelong commitment to the search of grace and transcendence" (www.brainpickings.org/2015/09/23). The feeling of joy and validation jumps through my soul when I see snippets of Al's work carried on in other works of personal discovery. I appreciate Elizabeth Gilbert's recognition of the success you can have with paradoxical attributes. There are further concepts to enjoy in her book — trust, persistence, patience — including the concepts of Marcus Aurelius' Meditations (p 171) and Einstein's "combinatory play" (p 258). Her book is a quick and enjoyable read. Gilbert, Elizabeth. 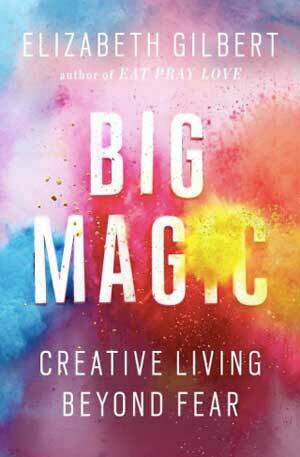 Big Magic: Creative Living Beyond Fear. Riverhead Books. 2015. Ye ha, ha, ha, ha, HA!! Evil doers seem to find humor in others' fears. Conquering fears is a big step toward vanquishing evil and ensuring good wins out. We grow up afraid of the dark, of the monster under the bed, the vampire, the werewolf, the growling dog down the street. We learn from our heroes that there are many ways to vanquish a monster — Buffy has her stakes, the witch in the Wizard of Oz was melted by water, soldiers have their weapons and demons are consumed by FIRE. As we mature, we learn routes to safety and that being ugly doesn't mean being dangerous. The friendly uncle and beautiful woman can be disturbingly cruel and manipulative so we keep a wary eye and listen to our inner warning voice. On Halloween, we sometimes dress up as something scary and learn to have fun with what frightens. We survive the blood-curdling movies and make fun of irrational fears. We talk about our hurts and our traumas and look death threats in the face. These all prepare us to be more resilient — to avoid danger, see alternatives, and reflect on complexity. As Pope Francis told a young girl, walk with someone so you don't feel alone. Later walk alone to build courage. Courage leads to joy and joy leads to hope. As Viktor Frankl taught us several decades ago, a hopeful vision can give us the strength to solve problems that overwhelm others and even survive a Nazi death camp. Appreciate your history of facing and scaring off the monsters.